Dr. Richard Herd (right) and the Forcier brothers. A dozen cows are in a pasture, standing in a circle looking downward. Could any of us, in our wildest thoughts, ever imagine that they would be looking at a freshly fallen meteorite that only seconds before had plunged into their field? It is a few minutes before sunset on June 14, 1994 in eastern Canada. Grazing cows have just witnessed a shower of meteorites - the 12th recorded fall in Canada - and the beginning of an event that would set many precedents over the next two years. The pastoral village of St. Robert, Quebec found itself instantly catapulted into the 20th Century world of meteoritics, research, and Cultural Property Laws. Every aspect of the St. Robert fall is remarkable. The fireball (brightness estimated at -18 magnitude) was seen over New York, Vermont, New Hampshire, Quebec, and Ontario by thousands of people. Optical and infrared sensors in Earth-orbit recorded its passage and multiple detonations were audible in Ottawa more than 200 km from the fireball endpoint. In Montreal, less than 25 km ground distance from the fireball's path, windows rattled and buildings shook. Many observers reported a dust cloud visible for over two minutes after the bolide's transition from fireball to dark-flight. Strangely however, there are no known photographs or video records of the event. Optical and infrared satellite data provided by the US Defense Department has enabled a consortium of Canadian researchers to determine many critical aspects of the St. Robert meteorite: probable azimuth of the ground path, 202 degrees, slope of entry, 58 degrees, fireball peak magnitude of -18 at a fragmentation altitude of 36 km, and the fireball end-height of 25 km. The satellite data has also contributed to preliminary determinations of mass, entry velocity, and orbital constraints. Many residents of St. Robert gave spectacular accounts of detonations, whistling sounds, the noise of objects falling through nearby trees, and the dull "thud" of impacts around them. Denis Racine was mowing his grass when he heard atmospheric detonations over the sound of his lawnmower. Looking upward, he saw three distinct contrails or "streamers." Vital Lemay was feeding his foxes when he too was startled by two to three "bangs," felt the ground shake and heard the low "thud" of impact. 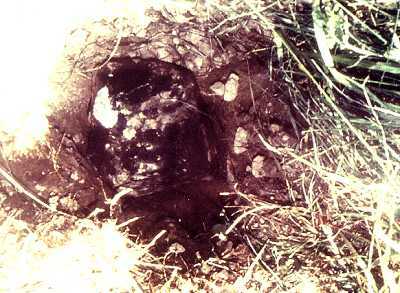 2.3 kg meteorite inside the small crater. But perhaps the most interesting account is that of Stephane Forcier who saw his cows "standing in a circle staring at something." Walking into the center he found a hole in the soft soil about 15 cm in diameter and 20 cm deep. Reaching into the hole, Forcier extracted a 2.3 kg "scorched-looking" rock the size of a cantaloupe that was cold! Collection and Principal Investigator of the St. Robert Fall moved quickly with the 2.3 kg mass. 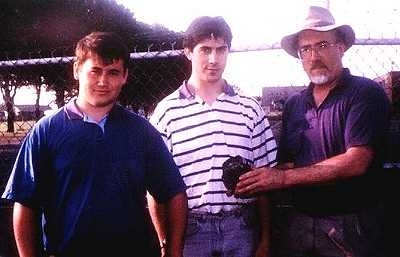 He hand-carried the meteorite to Battelle Laboratory in Richland, Washington, USA where cosmogenic nuclide measurements (the measurement of various isotopes of aluminum, sodium, etc.) began immediately. Analysis of these short-lived, cosmically-induced changes in the chemistry of a meteorite can reveal valuable information about its recent history. Isotopes of the element cobalt (cobalt-60 or 60Co) with a half-life of 5.272 years and cobalt-56 (56Co) with a half-life of 77.7 days can be used to constrain a minimum size of the pre-atmospheric mass if measured shortly after arrival upon the Earth. Levels of 60Co and 56Co in meteorites are inversely proportional to cosmic-ray shielding and thus become a function of depth within the meteoroid. Within 68 hours of the fall these time-critical measurements began - the shortest time on record for any fall. The levels of 60Co and 56Co measured in St. Robert were low and imply a sizable pre-atmospheric body of 700 kg for the lower limit and 4000 kg for the upper limit. However, theoretical modeling of the fireball trajectory, observed fragmentation, and acoustic measurements of the blast wave have refined this number to 1,500 to 2,000 kg before atmospheric entry. Given the entry velocity of approximately 12 km/sec, as obtained from satellite data, there should be a lot of this material on the ground somewhere. The monetary value of meteorites has risen dramatically in recent years. The number of collectors and educational institutions interested in acquiring specimens increases yearly while the available supply of meteorites does not. With any new fall or find, competition among dealers usually results in a bidding war that drives the price upward making it difficult for institutions with limited funds to acquire specimens. When meteorites fall on private property in Canada they belong to the property owner. The owner is free to either sell or retain the meteorite if they so chose. However, since meteorites are considered to be cultural property in Canada their export requires a permit. Interestingly, this law seems to have a "leveling effect" that works to the benefit of all by slowing down the process. The permit application time can be lengthy allowing time for the owners to explore various options of sale. Bidding wars between dealers that can become "heated" raising prices to unreasonable levels, are "cooled" by the uncertainty of when and if a meteorite will become available for export. Institutions such as the Geological Survey of Canada (GSC) can use this time to compete with the private sector by raising funds or helping the owner to explore what may be highly advantageous tax credits from the government if a meteorite is donated to a cultural institution. This is exactly what happened with two of the larger fragments of St. Robert. Richard Herd, negotiating on behalf of the GSC, purchased from Stephane Forcier the 2.297 kg meteorite spotted by his cows for $10,000 Canadian, and recently acquired the largest mass, 6.552 kg, from another individual through donation and tax credits. Both specimens are on display at the National Collections in Ottawa. 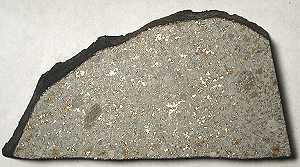 The St. Robert meteorite has been typed as an H5 chondrite and the first stony meteorite to be found in Quebec. 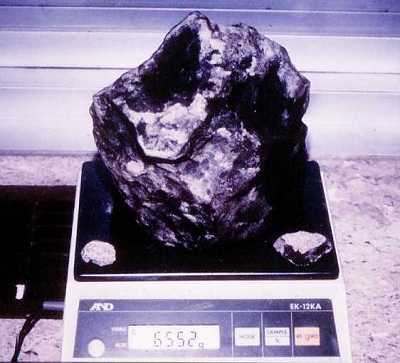 Studies of the fall indicate the total fall mass of meteorites larger than 55 g to be between 65 kg to 130 kg distributed through 120 to 240 fragments. Yet, as of this writing, only 20 fragments of St. Robert totaling 25.4 kg have been recovered within an ellipse-shaped strewn field measuring 8 x 3.5 km. This leaves approximately 40 to 100 kg still undiscovered in this populated area of southeastern Quebec. But where? Why haven't more been found? A veritable army of dedicated researchers and townspeople have painstakingly combed the area. The author expresses his sincere thanks to Gina Le Cheminant and Richard Herd of the Canadian National Collections, Geological Survey of Canada for their valuable assistance, professionalism, and knowledge. I would also like to recognize the authors of "The Fall of the St. Robert Meteorite," Meteoritics & Planet. Sci., July 1996, Peter Brown, Alan R. Hildebrand, Daniel W.E. Green, Denis Page, Cliff Jacobs, Doug Revelle, Edward Tagliaferri, John Wacker, and Bob Wetmiller. Photographs courtesy of Dr. Richard Herd. Russell Kempton is the Director of New England Meteoritical Services, based in Mendon, Massachusetts, USA.